How to Build a Better Student: Can a 16th-century discipline improve modern scholarship? Eloquentia perfecta may sound like one of the more benign spells cast by Hermione Granger in a Harry Potter novel. Yet to those well versed in Jesuit tradition, the phrase evokes an elegance and erudition in learning and communication, whether in public speaking or writing, that is directed not toward the mere perfection of these skills but toward service to the common good. Robert Grimes, S.J., the dean of Fordham College at Lincoln Center in New York, says that there are three components of eloquentia perfecta. “First of all is…the right use of reason; the second one is to be able to express your thoughts into words; and the third one is to [communicate] gracefully, that is, do it in a way so that people are willing to listen to what you say.” The eloquentia concept emerges out of the rhetorical studies of the ancient Greeks, but it was codified in the Jesuit tradition in 1599 with the Ratio Studiorum, the official plan of studies for Jesuit teaching institutions. Fordham University has turned eloquentia perfecta into the organizing principle of a recent revision of its core curriculum. The university is finishing its second year of an effort that will direct students in each class year to four different eloquentia perfecta seminars. What distinguishes eloquentia classes from a typical course is an intense attention to developing students’ written and oral communication skills. Students devote a higher percentage of class time to preparing and presenting oral reports; they must complete more writing requirements; and each assignment is more thoroughly reviewed and revised by instructors and often by fellow classmates as well. A number of other Jesuit institutions have been exploring ways to transplant this notion of “perfect eloquence” into a contemporary academic setting. That may not be as daunting as it sounds. Paul Lynch, an assistant professor of English at St. Louis University in St. Louis, Mo., and chair of the Jesuit Conference on Rhetoric and Composition, points out that in the discipline’s earliest days, students in rhetoric posted their arguments on walls where other students could view, dispute or support their positions. Such thinking in public, he says, is not far removed from the “crowd sourcing” he encourages in his classes today as students share and contribute to a single text through Google Docs. According to Mr. Lynch, the St. Louis faculty are just beginning to discuss how to apply the principles of eloquentia in a coming revision of the core curriculum. Steven Mailloux, President’s Professor of Rhetoric at Loyola Marymount University in Los Angeles, Calif., says modern educators found a justification for the university’s commitment to diversity studies through a concept out of the eloquentia tradition: “moribus gentium,” a requirement to study the morals or customs of nations and peoples. Loyola Marymount has proposed a revision of its core curriculum around eloquentia perfecta. The plan has been approved by the university senate and must now be voted on by the full faculty before development can continue. Do these efforts represent a 21st-century comeback for this 16th-century discipline? Part of the reason some Jesuit institutions are reviving eloquentia has to do with timing. Ann Mannion, an associate professor of history at Fordham University and director of its Center for Teaching Excellence, notes that every 10 years or so most institutions take a hard look at the structure and emphasis of their core curriculum to see whether adjustments or even major restructuring is in order. In an era of texting and Gameboy thumb fatigue, one might suspect that concerns about the capabilities of incoming freshmen would partly explain Fordham’s interest in restoring eloquentia. But while every generation of elders since Cicero seems eager to address the many deficiencies of the younger generation, Father Grimes says that was notthe case at Fordham. Mr. Lynch says his students face a complex of sources and modes of communication—Wikipedia.com, Glenn Beck and iPads, flash media slideshows and embedded YouTube videos. All these vie for attention and claim a legitimacy and authority that will demand supple analytical skills. A primary goal of the tradition, Mr. Lynch says, is to give students the intellectual tools they need not only to absorb that digital cacophony and make sense of it, but also to recognize true authority among all the competing “facts” and positions that make up contemporary media. In the past, an institutional emphasis on eloquentia perfecta may not have seemed necessary. With so many Jesuits in the classroom, men who were steeped in the tradition and whose classrooms may have been unacknowledged labs of eloquentia perfecta, a specific structural emphasis on the tradition might have felt redundant. These days, however, fewer Jesuits walk the halls of Jesuit schools, and a clerical version of the glass ceiling in Jesuit education has been cracking for some years. Only 19 of the nation’s 28 Jesuit colleges are currently headed by Jesuit presidents, and only a handful of Jesuits remain as deans of students. Loyola Marymount just appointed the first non-Jesuit president in its 100-year history—David Burcham, the son of a Presbyterian pastor. In some schools, the “second line of defense,” as Ms. Mannion describes the Catholic lay teaching staff, has also thinned out as appointments and advancement in scholarship became driven by credentials, and questions about religious beliefs during job interviews became prohibited by law. “All the 28 Jesuit colleges have to deal with it,” says Ms. Mannion. “Yes, they’re private institutions,” she says, “they’re Jesuit; they’re Catholic.” But now: “What does it mean to be a school in the Jesuit tradition?” Revisiting the dictums of the eloquentia tradition may allow institutions to shore up their Jesuit identity while reinvigorating their curriculum. Can this Jesuit style be properly interpreted by lay and even non-Catholic teaching professionals? Ms. Mannion says Fordham’s experience with its revised curriculum has been positive; its faculty has rallied to the challenge. After the renewed curriculum was approved, Fordham’s teaching professionals attended a series of workshops designed to familiarize them with the tradition and work through techniques that would allow eloquentia to become an effective part of their syllabi and classroom experience. “You can’t impose this kind of thing,” she says. The E.P. seminars, as the students and even faculty members have begun to call the classes, begin with a freshman seminar in English composition, a logical starting point given the concept’s emphasis on perfecting writing skills. But eloquentia is not limited to English or rhetoric and communications classes. The concept has been successfully incorporated into a number of different academic disciplines. Ms. Mannion says an E.P. class in natural sciences has been among the program’s most effective. “To argue with someone is to be with them, to be in community with them,” says Mr. Lynch. He worries that in contemporary public discourse what is retained is “all the struggling and the fighting with none of the togetherness.” It is critical, he argues, for young people to learn how to contend over ideas, how to conduct themselves in disagreement without sacrificing community. “They should be the product of a Jesuit education,” Ms. Mannion says. Listen to interviews with students and faculty at Fordham University. 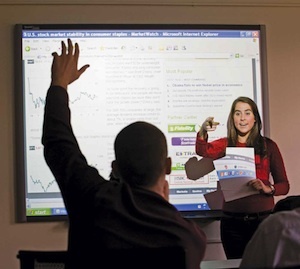 How great to see this approach to learning resurfacing on a Jesuit college campus! Forty years ago, as a high school English teacher, my most valuable tool for teaching writing skills was the Correct Writing Series published by Loyola Press. From the basics of grammar through the full composition, it presented a thoughtful approach to the written word. One of my students was told by her freshman English Composition professor that she was the best prepared student he had ever encountered. In addition, teachers were encouraged to have students speak before the class on a regular basis. They hated it at the time but again, a former student told me she was forever grateful that I made her stand on her two feet and be heard. This is an excellent article. My wife and I are educators at the collegiate level. Curriculum development and re-design are constant chores. I fear that the idea of education with the ultimate outcome to "serve the common good" is such a radical idea in today's fallen society that some excellent leadership will be required in all institutions to re-introduce this idea. Culturally, it seems, the focus has been on education to serve personal financial gain. The American Dream, if it is extant, is to become a celebrity ala "American Idol" or to become wealthy, ideally, through little or no effort by winning the state lotto. The "common good" is not fodder for every talk. "Celebrity" is the topic of every day talk. "What's in it for me?" is the metric used for personal actions. The dialogue needs to change. As I write this, there are many people clamoring for the release of graphic photos of Osama Bin Laden's body. Explanations of why the photos are not being released are viewed with suspicion. We no longer know how to walk the high road. "Something as modern as the pace and technological capacity of the digital age also has driven the recovery of this centuries-old discipline." I didn't notice a follow-up to this. What do the "pace and technological capacity of the digital age" have to do with these classes? There's nothing new about the information available on the internet - it was before and it still is the product of human minds. There is bad information now but there was bad information before. Are you suggesting that there's a much higher ratio of bad to good information on the internet than there was before? If so, are there reliable numbers on that? "In some schools, the “second line of defense,” as Ms. Mannion describes the Catholic lay teaching staff, has also thinned out as appointments and advancement in scholarship became driven by credentials, and questions about religious beliefs during job interviews became prohibited by law. "“All the 28 Jesuit colleges have to deal with it,” says Ms. Mannion. “Yes, they’re private institutions,” she says, “they’re Jesuit; they’re Catholic.” But now: “What does it mean to be a school in the Jesuit tradition?”"
What did it mean in the past? How has it changed, and why - other than because there are fewer Jesuits? Are you suggesting - but trying not to say - that the American government has made a Jesuit education in America increasingly difficult? This article How to Build a Better Student, really hit home with me. I had the valedictorian in my class for two years and never got him up once in front of the class. That has to change big time. Confirming the importance of peer review was also important. Elocquentia for me. This article also appeared in print, under the headline "How to Build a Better Student," in the May 16, 2011 issue.